For Canadians Sheila and Gunther Hammer, Hilton Head Island has been a home-away-from-home for several years. Escaping the cold of Toronto winters with friends and family in-tow, the couple comes down to enjoy the sandy beaches, green golf courses, and the laid back lifestyle that the island is known for. Having outgrown their first house in Long Cove Plantation, the couple sought a waterfront property on which to build a new home. They found the perfect harbor-front lot right next door in Wexford Plantation. The views were stunning, and the fact that they could dock their boat right outside the back door sealed the deal. Working with Court Atkins Architects, Cameron Custom Homes, and Kelley Designs, Inc., the couple created a dream home that suits their every need. A gracious two-story foyer opens immediately to the generous great room with its wall of glass to the view. From there, a large kitchen flows seamlessly into a casual seating area and dining room. 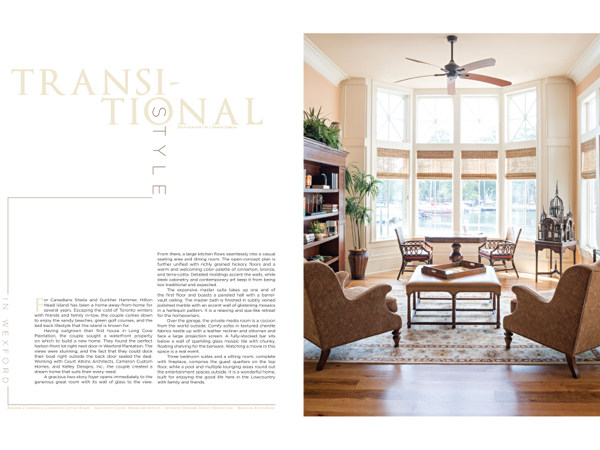 The open-concept plan is further unified with richly grained hickory floors and a warm and welcoming color palette of cinnamon, bronze, and terra-cotta. Detailed moldings accent the walls, while sleek cabinetry and contemporary art keep it from being too traditional and expected. The expansive master suite takes up one end of the first floor and boasts a paneled hall with a barrel-vault ceiling. The master bath is finished in subtly veined polished marble with an accent wall of glistening mosaics in a harlequin pattern. It is a relaxing and spa-like retreat for the homeowners. Over the garage, the private media room is a cocoon from the world outside. Comfy sofas in textured chenille fabrics nestle up with a leather recliner and ottoman and face a large projection screen. A fully-stocked bar sits below a wall of sparkling glass mosaic tile with chunky, floating shelving for the barware. Watching a movie in this space is a real event. Three bedroom suites and a sitting room, complete with fireplace, comprise the guest quarters on the top floor, while a pool and multiple lounging areas round out the entertainment spaces outside. 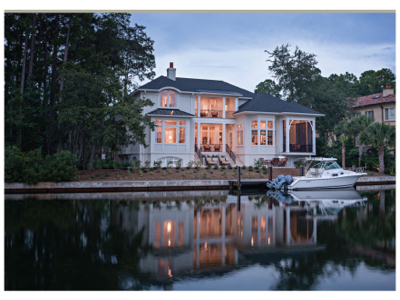 It is a wonderful home, built for enjoying the good life here in the Lowcountry with family and friends. This Wexford home is perfectly situated to take advantage of the harbor-front views. A covered balcony, Screened porch and poolside terrace offer options for entertaining. 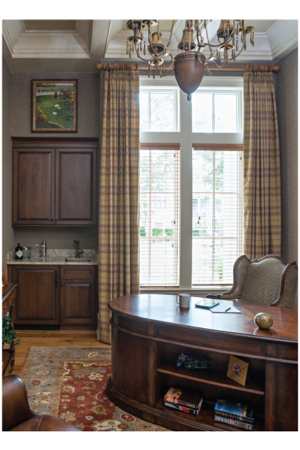 Ample windows throughout the residence take in light and scenery. 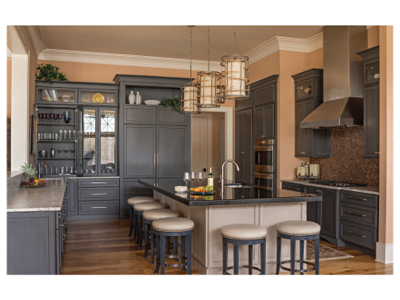 A generous island in the kitchen affords room for seating as well as prep space. Leathered granite on the light colored perimeter counters contrasts with the polished black Galaxy granite on the island. A full walk-in pantry is concealed behind cabinet doors to the left of the ovens. 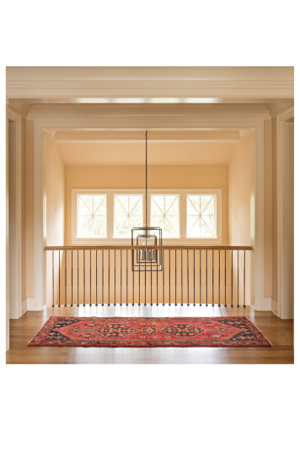 A stately chandelier accentuates the raised ceilings in the den. 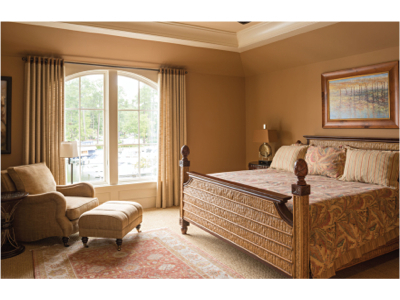 This bedroom overlooks scenic boats in the marina, with a cozy reading corner. The open concept plan of this home allows spaces to easily flow from one to another. 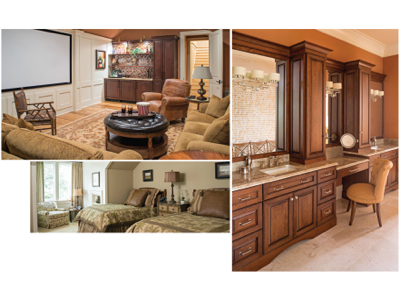 The cozy media room is comfortable for two but easily accommodates a crowd. The sumptuous master bath features rich cabinetry and polished granite and marble.